Kenton's Infotainment Scan: Advertiser or content provider? It's murky. 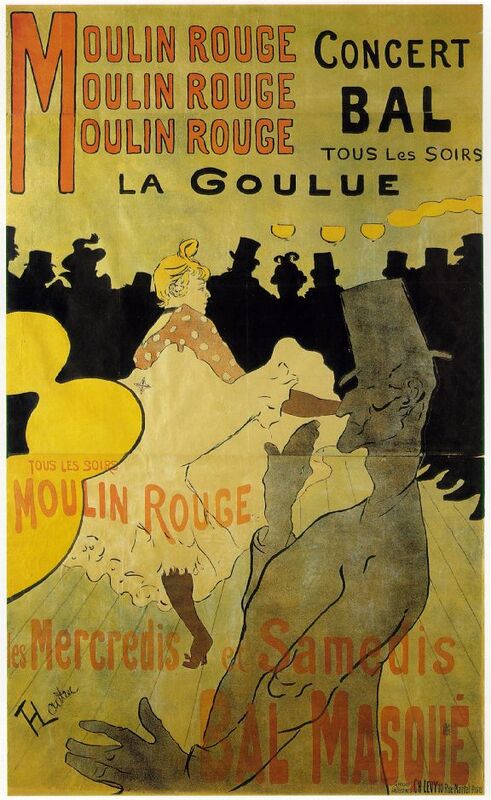 Toulouse-Lautrec - what a sellout. "Time was - things were different." My least-favorite local ad in history has a point: advertising and entertainment used to be two different things. Now, one of the first signs that you're talking to people "from the distant past" is that they still consider advertising to be "the stuff that happens when you go to the bathroom" - to be avoided altogether, tolerated for sponsoring the real content, and never enjoyed. But it's getting harder to answer the question, "What is advertising?" thanks to the breakdown of the traditional media model and a new landscape in which the means of production - fast and cheap technology - is available to everyone. About products, services, and ideas. Then, I get back in the time machine to the present (new glasses, receding Afro) and teach it the new way. If there's a lesson in advertising, it's that "marketing always wins." If eyeballs aren't on traditional ads, then marketing (and advertising) will adapt by creating its own content. This isn't a new idea - when radio was replaced by television, advertisers rushed to produce and sponsor "soap operas," one of the earliest examples of branded content (the art at the top of this page aside). The thinking: why buy an ad to air during a show that nobody watches when you can not only create the show yourself, but also the medium on which it airs? That's why all the excitement in advertising is happening in startups these days. Why work for the man when you can be the man by selling your company to Facebook for a billion bucks a year after you invent it? "The new creatives are frighteningly efficient and productive as hell. Their art might be sponsored, but it won't stop you from quoting, copying, and forwarding it to friends. They glide between disciplines and negotiate ethical boundaries with ease. "They enlist Vans or Old Spice to pay a premium for captivating or sidesplitting web videos, then spin their creations into a series for Bravo, Discovery, or FX. They're the reason Hollywood talent agents, New York publicists, and San Francisco startups are partnering to pitch branding campaigns with corporate giants." Fast Company has also launched a website to chronicle the morphing of art, culture, and commerce, called Co.Create. Whenever art and advertising get mentioned in the same sentence, there's a segment of the population - let's call it "old" - that gets nervous about where one ends and the other begins. But what we're seeing here is a re-imagining of what advertising can be: what if advertising can actually be entertaining, aesthetically pleasing, useful, and do good deeds? Ladies and gentlemen, I give you "advertising:"
1. Facebook/Twitter/Pinterest/Instagram/etc/etc/etc pages - If advertising is so terrible, how can Coca-Cola have almost 42 million Likes on Facebook? If you're counting, that's about 37 million more than the New York Yankees. "Coca-Cola has been donating Minute Maid juices to help Breakfast Clubs of Canada give youth a balanced, nutritious start to their day. Share their story and find out how to get involved." "Love how Coca Cola actually does things for the community, you never hear of Pepsi doing anything like this." 2. Branded apps - ColorSmart by BEHR, for example, is actually useful. So is the CIBC app, particularly for iPad. So are lots of apps. And they're free? Bring hither the branded apps! 3. Branded, socially responsible websites - Like Nike's Better World or Chipotle's Cultivate Foundation. Environment and social causes meet a big, promotional budget. Community relations goes high tech. 4. Sponsored music videos and films - Like BMW Films and HTML5 music videos, like Arcade Fire's We Used to Wait. 5. Sponsored you - Like the Museum of Me, which visualizes an archive of your social life, courtesy of Intel. 6. Sponsored lessons - YouTube keyboardist David Sides teaches piano lessons online. 7. New devices - Remember the iPod? That was the start of the rise of Apple: design and tech meet content and usability. 8. Sponsored comedy - Like DumbDumb, which produces funny ads and videos for brands. 9. Sponsored think tanks - Like Google Creative Lab. Tech meets higher thinking and crowdsourcing. Take that, crappy credit-union ad.